Narritjin Maymurra is one of the best-known and most prolific Yirrkala bark-painting artists. Examples of his bark painting are in collections throughout the world. 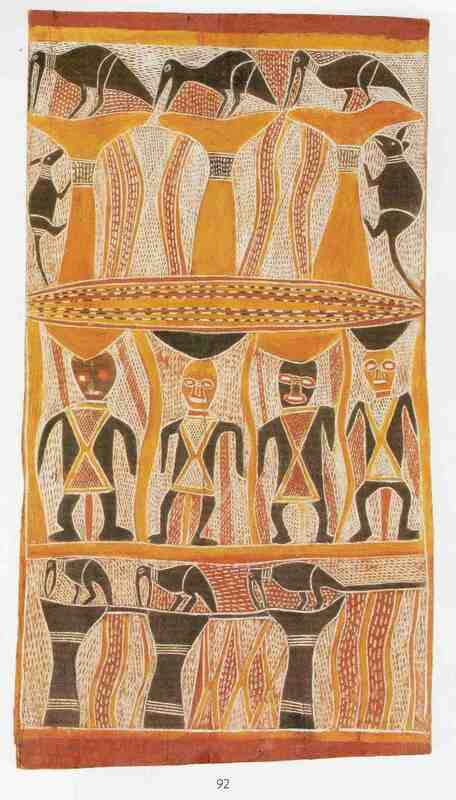 The aim of this article is to assist readers in identifying if their bark painting is by Narritjin Maymuru. It compares examples of his work. 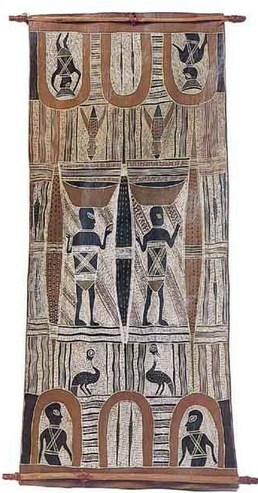 If you have a Narritjin Maymurra bark painting to sell please contact me. If you want to know what your Narritjin painting is worth please feel free to send me a Jpeg. I would love to see it. 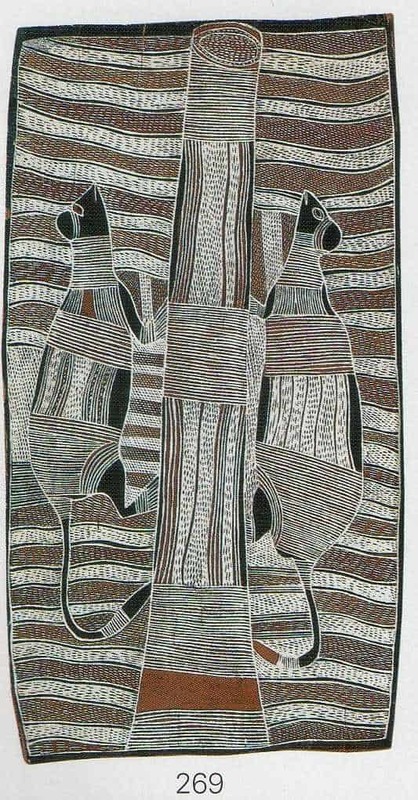 Narritjin Maymurra often separated his bark paintings into schematic panels. Vertical and horizontal features separate these Schematic panels. He painted backgrounds completely in rarrk crosshatching and in traditional motifs. These motifs include diamonds, rows of dashes, anvil shapes and an X pattern. He often depicts possums. Possums relate to the Marrngu ancestral story. Marrngu was a creator ancestor of his Manggalili People. Figures and animals on Narritjin barks have a black face and are static and formalized. Stark figurative elements contrast with the intricate background. Intense rarrk cross-hatching creates an optical clarity. Narritjin continued to use a human-hair brush and natural ochre long after alternatives were available. Maymurra has also done a few East Arnhem Land sculptures but they are not as collectible as his bark painting. Narritjin spent his early years hunting and gathering in East Arnhem Land. He lived in the area between Blue Mud Bay and Caledon Bay. As a young man worked with Fred Gray in the trepang industry. Narritjin moved to Yirrkala Mission soon after its establishment in 1935. He was one of the first Yolngu people to become a Christian. Narritjin worked with the missionaries to bring peace to the Yolngu. He negotiated peace and stopped them fighting among themselves. Narittjun Maymuru first learned to paint from his father Lotama Guthitjpuy. He was later taught to paint by his maternal grandfather Birrikitji. He tried to educate his children in both the old and the new ways. In the mid-1970’s he worked hard to establish an outstation for his family at Djarrakpi Cape Shield. A man of great traditional wisdom and known amongst his people as Guduwurru, (the western equivalent would be a philosopher). He assisted Birrikitji and Munggurrawuy Yunupingu with painting the Yirritja church panels. The church panels are now housed in the Buku-Larrnggay Museum.